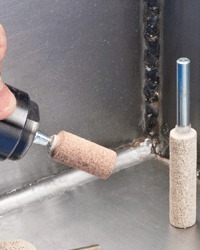 These abrasive impregnated cotton fiber mounted points are used in many different applications including tool & die, aerospace, automotive, fabrication and jewelry finishing for chamfering, deburring, cleaning, blending, and finishing. MX Cotton Fiber Mounted Points are ideal for use on stainless steel, aluminum, mild steels and exotic metals. They are non-loading on aluminum, brass and other non-ferrous metals. MADE IN THE USA. All with 1/8" mandrel. 10 pieces per pkg. Other shapes, sizes, grits available upon request. We represent System 3R: Sweden in India for their complete product range including micro precision holding devices for CNC machines and other higher end machine. We also offer complete automation for multi machine-multi operations supported by robots and works manager software to have unmanned 24hrs X 365 days production with practically close to zero down time of job management. We represent Or-Laser: Germany for their complete product range including micro laser welding and marking machines etc. At our technical center at Noida, world class micro precision welding and marking technology from Or-Laser Germany is demonstrated. We also support our customers with job work facility for commercial application support from our Noida center. We represent LKM: China, who are world leaders in the field of mold bases and standard dies & mold parts. LKM products have Quality-par excellence and faster deliveries for any size of mold. We represent World leaders in the field of Machine tools and related Accessories & Consumables. Our product range includes EDM Wire, EDM Filters, Power feed contacts, Deionized Resin, Wire guides, Ultrasonic polishing, texturing, welding & cleaning equipments etc. Our EDM brass wire electrode is used for higher end CNC Wire EDM. The "Total Manufacturing Process" of our high-accuracy EDM brass wire is a development of high-quality and top end procsses. Our range of wires are compatible with all the Top end manufacturers of Wire-EDM. Many years of unrivalled experience in manufacturing and R&D has enabled our products as a first choice for high quality applications.